« Cheese #11 (Cheddar Wisconsin 3 year). 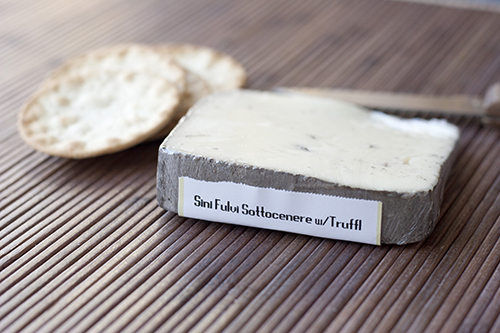 Cheese #12 (Fulvi Sottocenere w/ Truffles). J and I had truffle macaroni and cheese at a great little spot called Herbs & Rye which makes totally awesome flat bread pizzas. Neither of us knew what to expect, I mean I knew they were expensive mushrooms and supposedly they were great but after the first smell of the mac and cheese we were turned off. So much that we just had it sent back. The odor was so offensive to us that I had to put the dish on the table next to us to just get it away. It was interfering with our delicious pizzas. The staff was very cool about it and took it off our bill no problemo. 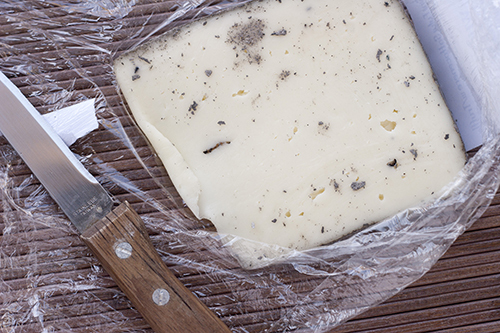 So I was surprised when I was sniffing around the cheese island at Whole Foods and came across this truffle cheese and I actually kind of sort of liked it. It was super expensive so I just got a small piece and it was great. Super creamy and coated on the outside with edible ash as opposed to a wax or something. During Christmas my secret Santa at work gave me a bottle of black truffle oil too and we’ve been loving it on popcorn ever since. Truffles are slowly finding there way into our hears I guess.